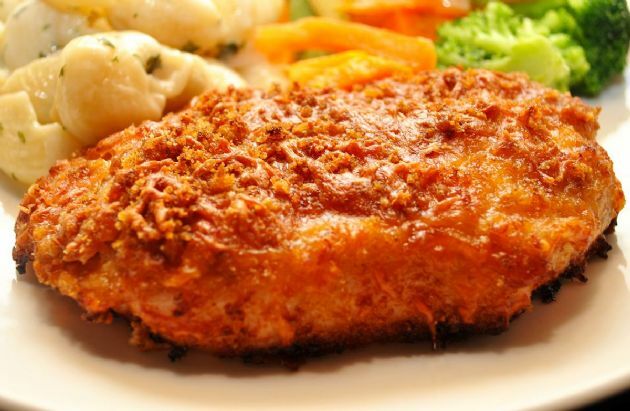 These spicy and moist boneless pork chops are made with no added fat, egg whites, evaporated skim milk, and a lively herb mixture. These spicy and moist boneless pork chops are made with no added fat, egg whites, evaporated skim milk, and a lively herb mixture. 4. Spray a 9xl3-inch baking pan with nonstick spray coating. 5. Remove chops from milk mixture. Coat thoroughly with crumb mixture. 6. Place chops in pan and bake in 375º F oven for 20 minutes. Turn chops and bake 15 minutes longer or till no pink remains.